Can a Plumbing Problem Ever Wait? | Brooks Plumbing Co.
Can a Plumbing Problem Ever Wait? Sometimes, there are plumbing issues that can, in fact, wait a bit. For instance, if you have a dripping faucet, a running toilet, or a single drain clog, you could probably let it go a day or two without causing irreversible harm. We don’t recommend this as it wastes water, but these are just a few examples of issues that aren’t that major. But what about more severe problems? What if you hear water rushing behind a wall, or feel a hot spot on your floor indicating a hot water line ruptured and you have a slab leak? Or, what if you noticed multiple drains in your home are backing up, which is the sign of a sewer line blockage? These all constitute as hygienic and/or damaging emergencies and definitely require a call to a professional plumber in Olympia, WA. But what can you do in the meantime? The best thing you can do in a plumbing emergency is shut off the water altogether. True, this isn’t going to immediately solve any problems or help with water damage that has already occurred, but you can at least prevent the damage from growing. Every home has a main water shut-off valve that cuts off the water supply in the whole home. Be sure that each of your family members knows where it is and how to use it. This way the moment there is a problem with your plumbing, the water can get shut off right away. In some cases, individual plumbing outlets will have their own shut-off valves that cut off water to them while keeping it running in the rest of the home. If you’re sure the problem is localized to such an outlet, you can use that valve instead of the main valve. This is most commonly seen in multi-unit housing like condominium complexes. In many cases, an emergency plumbing call depends on the extent of the damage and whether or not you can wait for regular hours. For example, if the damage is localized or if it’s just a few hours until a plumber can make a regular service call, then you may not need to incur the added expense of making an emergency call. 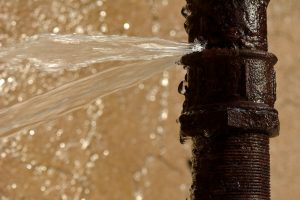 In many cases this is preferable, and there are steps you can take to mitigate damage if a plumbing problem has led to a flood, especially if you were able to shut off the main water line. We would advise that you turn on all your fans (and add boxed fans to the mix) and use towels to soak up any water on your carpets or flooring. It’s a good idea to leave the fans on for 24 hours after everything seems dry, as water can get deep into your carpet and its padding. In fact, it may even be a good idea to look into carpet replacement, if possible. This will help reduce the risk of mold growth rather than letting the water just sit there. For more great plumbing tips and quality plumbing services, contact Brooks Plumbing Co. today!